Egypt has begun campaigning for its candidate for United Nations Educational, Scientific and Cultural Organization (UNESCO) Director-General post, Moushira Khattab. Moushira Khattab is a human rights activist and former Minister of Family & Population and former ambassador. Khattab boasts a large experience in the UN system. She was confirmed country’s candidate last year by the Prime Minister. Cairo Tuesday wooed Algeria’s vote as former foreign minister Mohamed El-Orabi arrived in Algiers to get Algeria’s support for the Egyptian candidate. Omar Abu Aish, Egypt’s ambassador to Algeria who also attended the meeting told Asharq Al-Awsat that Orabi will also visit other capitals to secure support for Khattab. 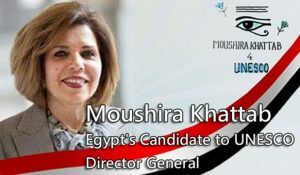 The Egyptian candidate will face eight other contenders including Hamad bin Abdulaziz Al-Kawari from Qatar, Qian Tang from China and Audrey Azoulay from France. The election of the future Director-General will take place next month during the UNESCO Board’s 202nd session. Posted by KanelkaTagba on Sep 13 2017. Filed under Headlines, World News. You can follow any responses to this entry through the RSS 2.0. Both comments and pings are currently closed.